In keeping with my tradition of making cookies on a stick for special occasions, I just had to make one for Easter. 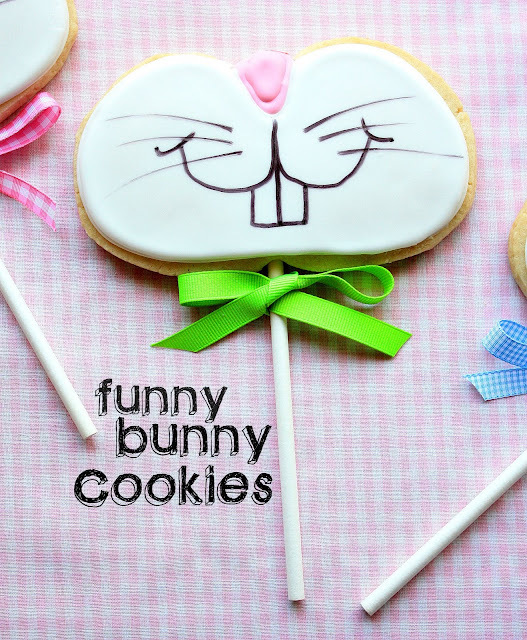 What could be better than a Funny Bunny cookie? 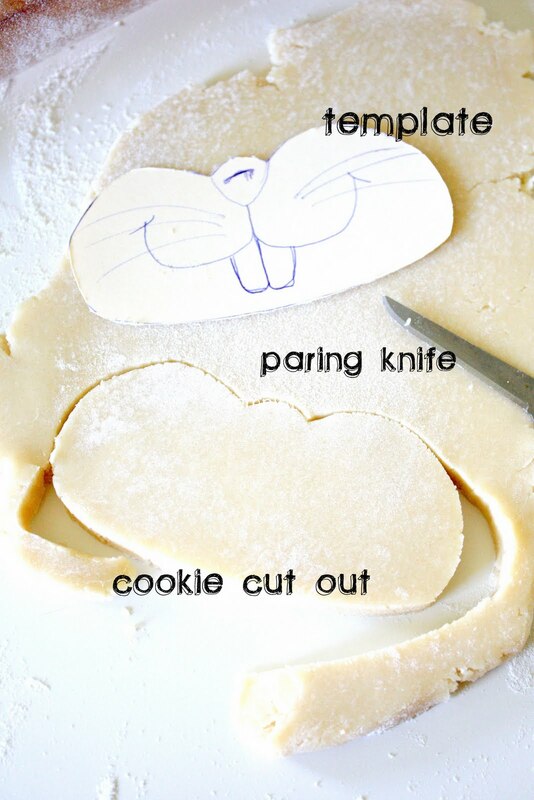 I'd noticed various paper versions around the web which sparked the idea for this cute cookie. I drew out the template on a file folder, cut it out and then used it as the pattern for the cookies. I rolled out the sugar cookie dough fairly thick to accommodate the stick and cut out each cookie with a paring knife. After I placed the cookies on the stoneware I inserted the sticks. To insert them, gently put pressure on the cookie (dough) with one hand to hold it in place, and slowly insert the stick(twisting a little to help it along) with the other hand, inserting it about halfway up. After baking let the cookies cool and firm up a bit before transferring them to a cooling rack. After cooling completely, ice the cookies(all white except for the pink nose), and let dry completely. They may then be detailed with black royal icing or an edible marker. I made it easy on myself and used my Americolor edible black marker for the facial details. I let my cookies dry overnight before I applied the marker. Voila! 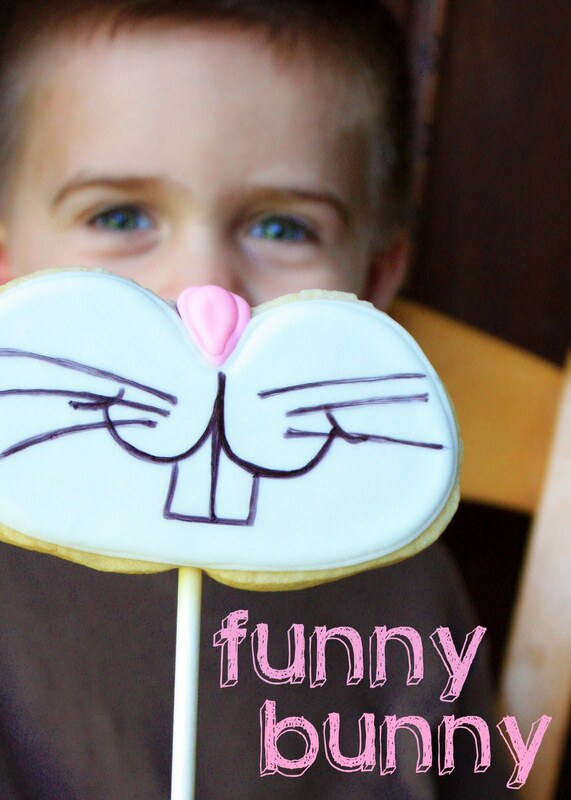 Now you, or your munchkins, can be a Funny Bunny! (I had a reluctant model, but did manage to hold up the cookie and get a quick shot.) It's easy to make a whole family of Funny Bunnies:) HAVE FUN! Click HERE to link directly to the cutter! Cute Easter treats, Sue! Love it! Oh my gosh these are too cute! Love Zeke's little smiling eyes back there! Adorable! And how sweet is your little model?! I love the bows too, they add the perfect touch. Seriously Sue! Every time we see one of your posts pop up at Inspiration Friday Vanessa and I both squeal at the adorableness of your latest project! I literally called her last night and said "check out Sue's latest cookie, every child should be so lucky to have a grandmother like her." :) You creativity is beyond wonderful! Thank you for sharing it with all of us. Have a great day! You come up with the cutest ideas. I love that you only did half of the bunny face. Perfect! 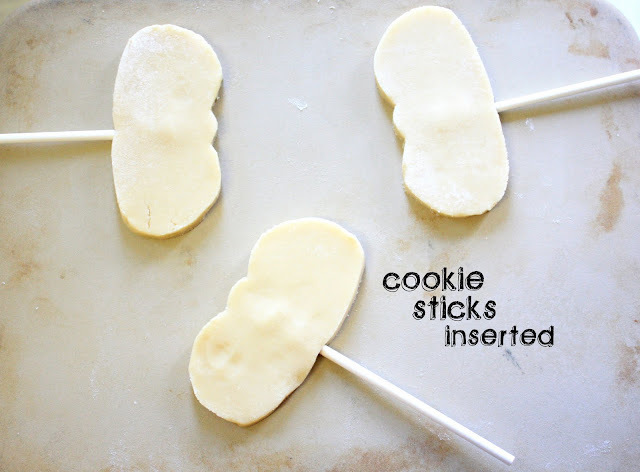 I cannot wait to see what else you do with these cookies on a stick! You are so clever and talented. So cute - I love to see the little ones enjoying their snacks!! Thanks for linking up to Foodie Friday. Every time I click on your blog I smile! 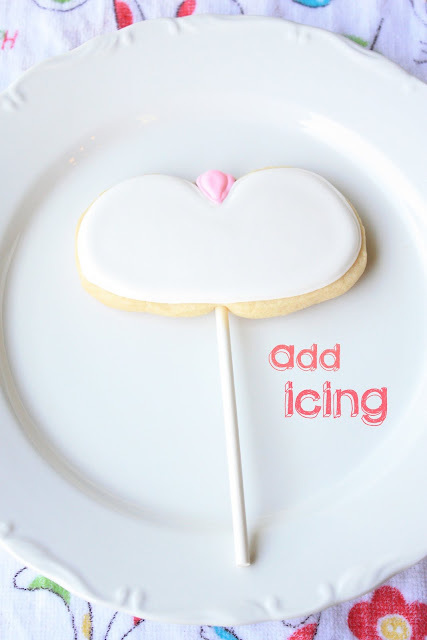 Thanks for another darling cookie idea. I may make this with my daughter and granddaughter when the come to visit next week! Thanks for another fun idea. Oh my gosh! How cute are these! You really are a cookie baking/decorating genius! You are so talented! I'm so envious! These are so adorable, I could eat one right now! These are so cool. I love your creativity SUE. These are very cute...great idea! I've been looking for some fun Easter treats to make with my kids! These are adorable. I so wish I had your awesome cookie decorating skills....they are so amazing looking! Sue I have this big cheesy grin on my face looking at your funny bunny cookies! They are adorable! You did such a great job cutting these out Sue! Love your cookies! I think you should do a cookie cookbook. Ok! these are just the cutest thing I've seen all week! lol Adorable!! Thanks so much for linking up! I featured your post in my wrap up! http://tidymom.net/2011/spring-ideas/ Have a GREAT weekend! Sue, I LOVE-LOVE-LOVE these....was hoping to get some bunny cookies made, love the face. ON A STICK no less....so creative!!!! Love this!!! SOOOOooooo stinkin' cute!! Love these cookies. I'm going to have to get me an edible marker right now! LOVE these! 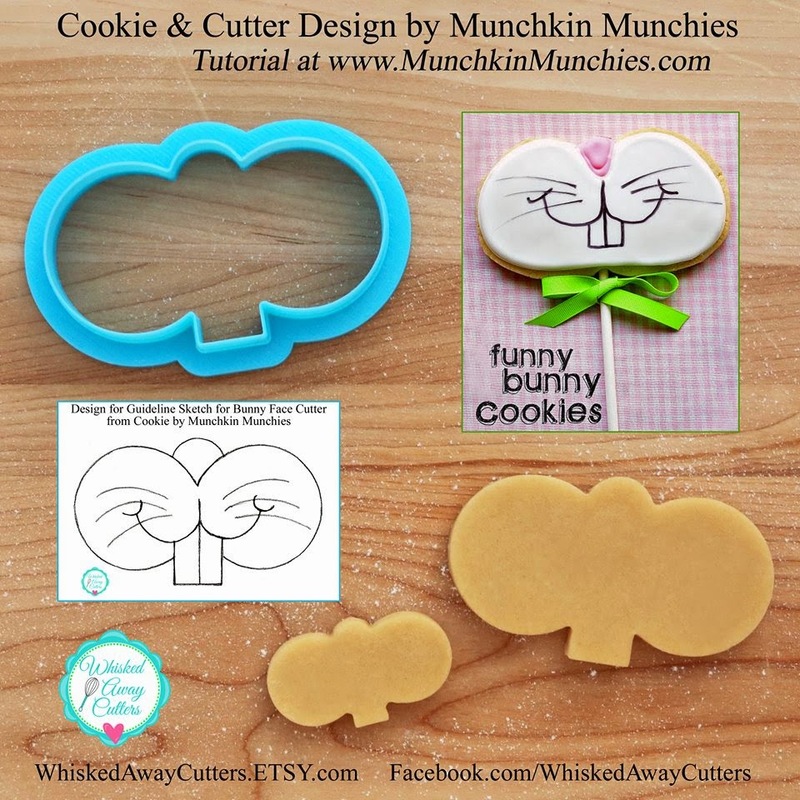 I wonder if you could use a pumpkin cookie cutter and get a similar shape. Sue this is totally adorable, you have been coming up with some spectacularly cute ideas lately. These are just too adorable! You did a great job. I've never used an edible marker, but now I'm dying to try one. Thanks for the wonderful recipe and idea. How adorable is that!!! I love it. What adorable cookies! I love them! How cute are these?!?! I love how they turned out! Yummy! How cute are these cookies! You are so clever! I think these are adorable and how cute are they on a stick! Congratulations on your new grand daughter! Have lots of fun with her! Wow, Sue. can I borrow your muse for a while? You must have a fantastic one since you have these insanely cute and creative ideas all the time! These are great! i bet you could use a pumpkin cookie cutter for the shape and just squish it out and down?....Thanks for sharing your creative process! Love these! new follower. I actually thought the cookie cutter was a pumpkin. I need an icing marker! I'm spreading the word about your fabulous blog on my fan page! I think my fans will love your bunny on a stick! Adorable. My kiddies would love these! Sue....these are BEYOND cute! I LOVE them! so creative and just perfect! Happy Easter! They are so COOL! I love the smiles on the bunnies' faces. That will put lots of similes on little kids' faces. These are such a fabulous idea! I love it! I bet your kids were thrilled. How adorable are you and these cookies~~ I can't wait to try these this weekend with my little one. And am now following your site!! Do you think I could use Wooden skewer instead of the lollipop sticks? I have a big bag and would like to use those if I could! I wanted to let you know that I featured these in my "What I Bookmarked This Week" post -stop by and check it out. Thank you for this awesome idea and great tutorial! We had a "cooking" birthday party for our daughter on Saturday and the girls loved making their Bunny Masks! I'm going to link back to you today with our pictures. Thanks!!! Can't wait to follow your blog and copy more great projects! Ah how fun! You are so creative! Thank you, thank you, thank you for dreaming these up! I made them for Easter and we had a BLAST with them! What a great idea! I have a question about the sticks....you bake the sticks into the cookie right? so are you using plastic lollipop sticks? or the paper ones? im thinking plastic in oven equals big mess. These are so cute, Sue! I can't wait to include them in my Easter sweets roundup next week! I can't wait to make these this Easter! Thank you!